U.S. Supreme Court nominee Judge Brett Kavanaugh leaves after a meeting with Senator Joe Donnelly at Donnelly's office on Capitol Hill in Washington D.C., U.S.
Democrats in the U.S. Senate said on Thursday they were prepared to sue the National Archives if it does not honor their request for information on Supreme Court nominee Brett Kavanaugh. The threat ratcheted up the Democrats' fight with Republicans over documents on the conservative federal judge nominated by President Donald Trump. Senate Democratic leader Chuck Schumer told reporters he plans to meet with Kavanaugh next week. [post_ads]Democrats are seeking documents from Kavanaugh’s service while working in the White House under Republican former President George W. Bush. Last week, several Democratic senators filed requests under the U.S. Freedom of Information Act (FOIA) to try and compel the government to release the records. "Today we are announcing that we stand ready to sue the National Archives for Judge Kavanaugh's full records if necessary, if the FOIA request isn't granted," Schumer told reporters in the Capitol. 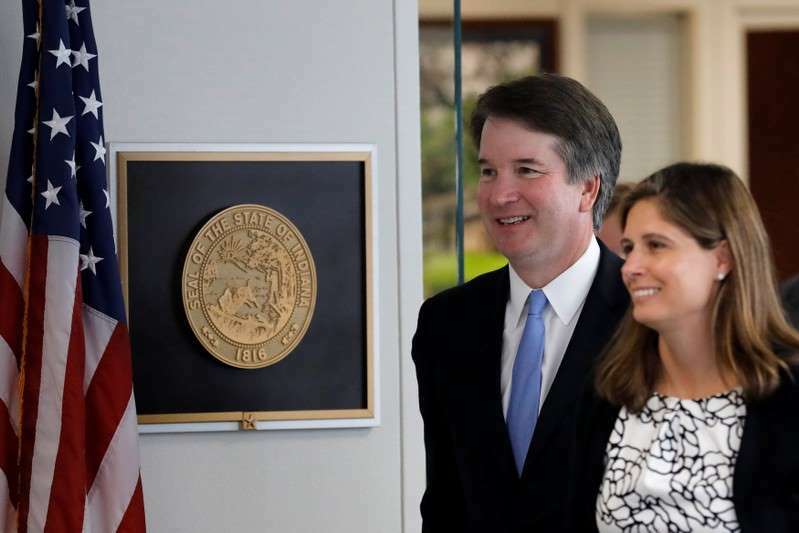 "The American people deserve a methodical and thorough examination of a nominee to the Supreme Court, who will yield immense influence on their lives." Democrats have charged that Republicans are dragging their feet on producing the documents needed to properly vet Kavanaugh, but Republicans say the Democratic demands are designed to delay a Senate vote. Democrats want to know about any involvement Kavanaugh may have had on controversial issues before the Bush White House such as policy toward torture, the Guantanamo Bay, Cuba, detention facility and other matters. Some documents from Kavanaugh's lengthy career have been released, but Democrats complain that a former deputy to Kavanaugh has been allowed to selectively release the papers. "I am going to meet with him (Kavanaugh) next week and I'll ask him all about these documents and what he intends to do about it. "He should have said already, he wants them released ..." said Schumer, who has vowed to fight Kavanaugh's nomination. Trump nominated Kavanaugh, 53, on July 9 to replace retiring Justice Anthony Kennedy. Before he can assume the lifetime job on the nine-member court, the Republican-controlled Senate must vote to confirm him. Confirmation hearings are set to begin Sept. 4, and Republicans are hoping to have Kavanaugh confirmed by the time the court starts its next term on Oct. 1. Kavanaugh has amassed a solidly conservative judicial record as an appeals court judge for 12 years. His confirmation will require a simple majority in the 100-seat Senate, where Republicans hold a 51-49 edge over Democrats and independents.